I know there are a million recipes for pumpkin bread, but I will add this one to the internet on account of a request. This recipe comes from the cookbook Baked: New Frontiers in Baking, and there are many winners in this book, especially when it comes to cakes, but this is a great recipe, too. Sorry to my cousin that it has taken me so long to post it! I’m just getting back to life, post holidays, vacation, sick kids, etc. 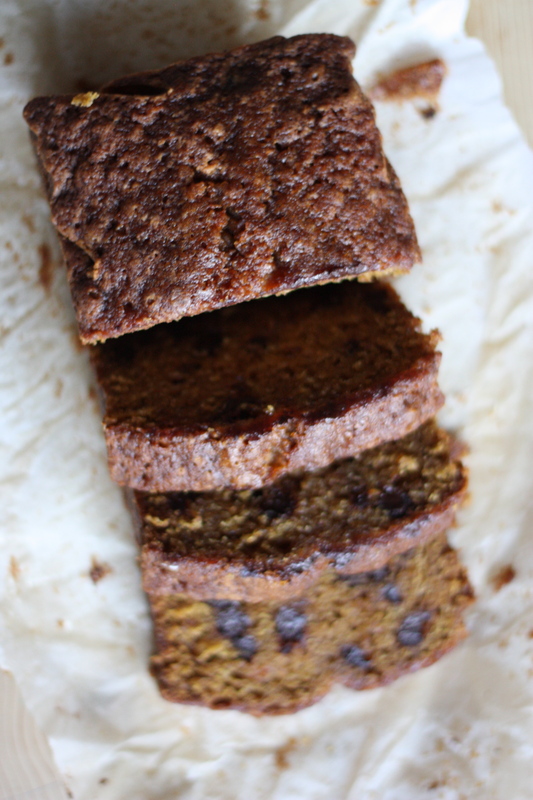 I love the Joy of Cooking’s recipe for pumpkin bread as well; any pumpkin bread is great to have around for the weekend. Preheat the oven to 350 degrees. Grease and flour (or line with parchment paper) 2 9×5×3-inch loaf pans. In another large bowl, whisk together the pumpkin puree and oil until combined. Add sugar and whisk again. Whisk in the eggs one at a time, then add the vanilla. Fold the dry ingredients into the wet ingredients, until just mixed, then add the chocolate chips and briefly stir again. Spread the batter into the prepared pans, and gently knock the bottom of the pan onto the countertop to even out the batter. Use a spatula to smooth the top. Bake in the center of the oven until a toothpick comes out clean, about 75 to 90 minutes, rotating pans halfway through. Cool on a wire rack for 15 minutes before inverting the loaf onto the rack to cool completely before serving. The loaf will keep for 3 days or more wrapped in plastic wrap or in an airtight container at room temperature.